Mackenzie and Bo were as fun as they come! As effortless as the sand and surf, it was like a competition to see who could smile bigger. We had a ball designing their vintage wedding down at Embassy Suites Mandalay Beach in Oxnard... literally. Mackenzie requested we fully design her big day, so we gladly went to town. We designed and installed lanterns in champagne, beige, and navy colors in the reception ballroom before lacing a vintage typewriter with budding blooms. 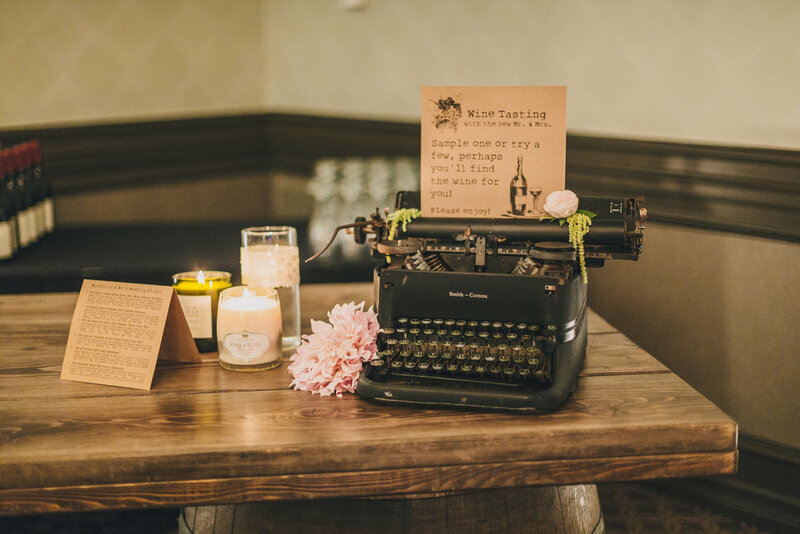 We arranged antique books for their centerpieces and arranged for wine barrels to accompany their ceremony. With gold and silver chiavari chairs being the main choices for chairs these days, we enjoyed selecting the cocoa shade to bring in that antique feel. It even darkened the room just a tad so that the wine-bottle candles could dance! At their bar, we thought a wine-tasting stand would bring a touch of Napa/Sonoma down to So Cal. Congratulations, darling Mackenzie & Bo!